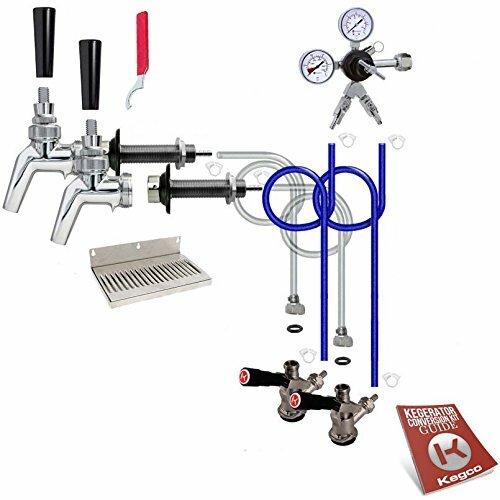 If you want to ensure your beer tastes the way the brewery intended, there isn't a better choice than the Kegco premium two faucet door mount kegerator conversion Kit! from the coupler probe to the shank to the faucet, your beer only touches 100 percent stainless steel metal components and food grade thermoplastic vinyl beer lines that will not give off any plastic taste. In addition, the Perlick perl faucet features an innovative design that will not stick, even when dispensing heavier beers. Included in the Kit are a two product, double gauge regulator for dispensing two beers at the same pressure and a wall mount stainless steel drip tray that can easily be removed for cleaning. If you'd like more information on the benefits of this Kit, feel free to give us a call at 1-800-710-9939 and one of our draft beer experts can further Explain the advantage of buying a premium Kit.